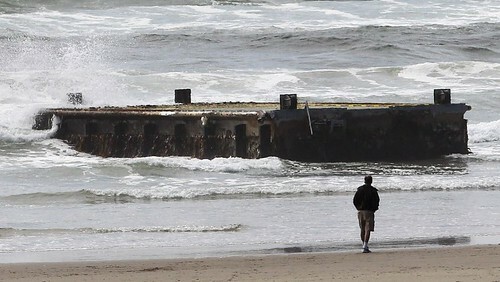 As implausible as it may seem, a dock from Japan the size of a train box car has washed up on the Oregon coast, http://abcnews.go.com/Technology/wireStory/dock-japan-tsunami-washes-ashore-ore-16516249. "What happened to reactor 4?" Is the apparent perpetual shaking due to some diffraction/distance effect? It gets real good around the 6:00 minute mark . I love the black out and the agonizing yell . Is this some kind of Fukushima Dark Shadows serial or something? I did a search for Part 5....to see what happened when the lights went out.....but it looks like I will have to wait until next week. At the risk of stating the obvious, why is it that the driver is not wearing a mask? Hi guys. This is to bring to your attention of what I see is propaganda and fearmongering about the ongoing Fukushima Disaster and how it will supposedly wipe out life on Earth as asserted by many conspiracy theorists on popular conspiracy forums. One thing which I find curious is the rapid decline in the usage of Nuclear Power this decade. Germany announced earlier this year it would abandon Nuclear power completely by 2022. And due to the 2011 Japan Tsunami disaster, Japan has shut down ALL of its nuclear power stations recently. Now if we assume that Nuclear power is an elaborate hoax, then this move by governments to quickly decommission Nuclear power stations after staged "disasters" is of no surprise. And this current fearmongering that this Fukushima disaster will "wipe out life" on Earth is just reassert the Nuclear myth. Would like to hear your thoughts about this. Some good photos here! Tongue firmly in cheek! I asked my four year old son what he see's here! "All the toys have been scrapped" he said! The Exif for particular photo reports Adobe Photoshop CS4 Mac as the creator! Interestingly enough, the plane in the middle, JA3743 is actually registered to Fukushima. "A privately operated Piper PA-28R-200, JA3743, took off from Yamagata Airport for a leisure flight on October 19 (Thursday), 2006, with only the pilot-in-command(PIC) on board. Around 14:32, the aircraft sustained damage as it landed at Fukushima Skypark Airstrip, Ozaso, Fukushima City, Fukushima Prefecture"
Interesting, ne? Would they fake with tail numbers so accutrate? With ref above pic; EXERCISE: take a real car, with an engine in front, and throw it into water. Take a picture. Compare! Interesting story tangential to the employees of the power station - it's about why the employees of the power company have to "hide". Their explanation? Bullying at school. According to one parent who works for TEPCO in Chiba Prefecture “it’s the influence of morning talk shows with topics critical of TEPCO” which the children watch before going to school. The employee also claims that the verbal abuse was especially strong from female students who would lay guilt on their son for not being able to become mothers in the future or by showing him pictures of abandoned dogs and cats of Fukushima. It got to the point where the son had to transfer schools and now must keep his parent’s occupation secret. This incident occurred in an area labeled as a “hotspot” which is an area containing places with high levels of radioactive contamination, so tensions are surely high. However, according to another anonymous TEPCO worker in Tokyo “it’s the worst when there’s talk about raising the electricity rates” showing how the problem goes beyond radiation affected areas. The worker claims that children of TEPCO employees are demanded they give their money to classmates in order to “compensate” for Tokyo Electric’s rate hikes. Tufa wrote: With ref above pic; EXERCISE: take a real car, with an engine in front, and throw it into water. Take a picture. Compare! There is no way to tell the depth below the scene. In fact, everything seems to be in shallow water. So the nose down sinking of a Front engine car will not be the visible effect. Most of the wheel (even of the aircraft) is visible. This ship, for instance, seems to float remarkably well in shallow 'Japanese tsunami waters'. Perhaps Japanese fishing ships have no keels? Totally with you there Simon. My point was really for the Aircraft Tail number (easily painted onto a model, but that much accuracy... made me wonder). To Tufa's point, I'm saying the set-up/real shot in question has everything at a curiously uniform shallow depth except for the odd car with nose in ground etc. And anyone wonder whatever happened to those giant cracks in tokyo ground, splitting the seams of the earth, side-walk wobbling... did all that just auto-glue itself back? Title: Japan Earthquake 2011: Ground Splitting Footage on Youtube. The above link will take you to a page that contains the environmental radiation levels in Tokyo per day. I would post the data here, but it would compromise the readability of this thread. Let us focus on the AVERAGE (microgray per hour) reading. The data shows a spike on March 15th, 2011 - 4 days after the event happened. AFTER 3/31/2011, the radiation readings drop to pre-event levels and stay that way until the present date. The data effectively and conclusively shows that there is no ongoing radiation threat; these levels of radiation present no significant harm. Hello everyone. I know that normally I sit on the sidelines of these things and try not to inject too much random information, but I am genuinely confused and bewildered by some of the stories coming out about Fukushima, from a Japanese-expat entertainment web site known as Rocket News. The towering 88-foot tall pine tree was the last standing among a forest of 70,000 trees that were completely wiped out along the coast in Rikuzentakata, Iwate prefecture. In response to which, an astounding 47 percent of staff replied that the company that paid their salary was not the same as that which organised workers and provided instructions. The situation appears to be that the original subcontractors are in turn subcontracting work to other groups or workers. The cycle is then being repeated, giving rise to a multiple subcontract working system where it is difficult to know who is really in charge. While the original subcontractor might well be operating legally, with multiple subcontracts overlapping in this way, the practice of passing designated work down from subcontractor to subcontractor ultimately creates a breeding ground for unscrupulous activity. Got Three Months to Spare? Why Not Make Big Bucks Doing Manual Labor in Fukushima Disaster Site? That’s right. Currently there is a job offer for work inside the nuclear power plant of sunny Okuma, Fukushima, home to the Fukushima Daiichi reactor. Now, before you tell me to go screw myself, they’re offering 30,000 to 50,000 yen (US$319-531) per day for three months. Let’s take a look at the offer in full. To mark the second anniversary of the March 11 disaster, student volunteers in Vancouver spent two days dealing with the lingering effects. They collected more than 40 large trash bags of tsunami debris that has been littering beaches on Vancouver Island’s Pacific Rim National Park. ... with tons of before and after photos of devastated areas. My initial reaction is to doubt all the stories of people and numbers out of habit with the news, but I wonder if there isn't something so fishy and in-your-face obvious as Sandy Hook that it's bait for conspiracy theorists -- particularly in regards to the Fukushima workers, and how strange the operation seems to be. Rocket News seems to be hyping the story of deadly toxic out-of-control radiation, and thousands upon thousands of innocent lives lost a couple years ago, with an increasingly devastating problem. It seems to be a rather American perspective compared to the cool and collected official Japanese position. I live in Tokyo, been here for a very long time and I thought that maybe a brief recap could be useful. If the forum Administrators find my post irrelevant, please feel free to delete it. The earthquake was initially reported as 7.9MW by the Japanese MSM before it was gradually upgraded to 8.8MW, then to 8.9MW, and then to 9.0MW. This upgrade is an important parameter in analyzing the aftermaths of the event because the 9.0 figure 'justifies' the ensuing tsunami and its presumably epic proportion as well as the legal consequences of the event. The magnitude of the quake helped qualify its circumstances as 'unforeseeable' and thus led to no liability for all the parties involved in the design of Fukushima nuclear plant and its construction which left TEPCO as the only entity liable for the damages. Most of the Japanese MSM relayed the information given to them by the Japanese government. The TV reporting of the events as they unfolded looked like a traditional Japanese TV drama, each 'episode' having its fair share of suspense: will a reactor explode? will the TEPCO people be able to cool down the reactors? what if there is an aftershock powerful enough to blow up the whole plant? what if there is a radiation cloud coming from Fukushima to Tokyo? maybe TEPCO will have to bury the reactors into cement to avoid the risk of radioactive contamination in Japan or even worldwide, maybe not? if only TEPCO could manage to restart the electrical circuit that controls the cooling down of the reactors but can they? no, finally they couldn't so they are pumping up seawater to cool down the reactors but wait now they have a new problem, not enough pools to store the radioactive material that has leaked from some reactor, etc, etc... in the meantime, they (the Japanese MSM) kept reassuring the public that all these problems, although very 'real' and very serious, would be fixed sometime soon or maybe not so soon. Japanese people remained composed probably for three main reasons: 1) their own government and TEPCO have been involved in so many public scandals and lies that the Fukushima event and the way it was handled were to no surprise to Japanese people 2) Japanese believe it is useless to fight 'destiny': if you are meant to die on (X) day, you sure will thus it is foolish to try to escape your own destiny 3) Japan is their home-country so even for those not believing in 'destiny' considering to escape: where to go unless they could manage taking days off work and had enough money to 'wait and see'? and when the time would come to go back home, would their colleagues, friends and family who stayed in Japan ever forgive those who left? Most of the foreign MSM were basically saying that all the people living in Japan will perish and that the whole planet will be forever contaminated. During that time, some corporations relocated their employees from Tokyo to other locations within Japan or to other countries such as Singapore and Hong-Kong. Foreign embassies in Tokyo shortly after the quake started to fight publicly with each other over the gravity of the situation and over which information the embassies should convey to their respective nationals living on Japanese soil. All this public debate greatly helped confuse the foreigners who didn't know anymore which embassy and which information they should believe. The French embassy informed its nationals by email that thousands iodine tablets will be shipped by plane from France to Japan and as the plane would be flying back to France without passengers, the embassy was offering a free ride back home to the French nationals wishing to leave Japan, in the limit of the seats available. It wasn't long before a blog called 'Flyjin' (flying-gaijin, gaijin=foreigner) ridiculed people who left. A friend of mine has a Geiger counter, he measured the level of radiations in Tokyo, everyday for many months after the quake: no alarming level of radiations - that confirmed the measurements that METROPOLIS magazine (English magazine distributed in Japan offline and online) was providing to the English speaking community in Tokyo. On September 18, Tokyo Electric Power Company (TEPCO) started up its Fukushima I-3 Nuclear Power Plant (BWR, 784MW) using MOX fuel. It loaded MOX fuel into the reactor on August 21 and plans to begin generating electricity on the 23rd. Over 10 years had passed since this fuel was fabricated. It was fabricated between 1997 and 1998 and arrived at the nuclear power station in 1999, but it was never loaded. Falsification of fuel quality control data for MOX fuel for Kansai Electric Power Company's Takahama-3&4 nuclear power plants was discovered and troubles and cover-ups were discovered at TEPCO nuclear power plants. In response, the prefectural government revoked its agreement with TEPCO. On January 20 2010, TEPCO applied again for permission to use MOX fuel and on August 6 the governor gave his consent. Overall the 'event-script' looked like a rehearsal or a test on people's reaction with a distinct emphasis on how to displace a large number of people of all nationalities within a very short time-frame - and the 'Green' agenda, just the tip of the iceberg? Somehow, there is a common denominator between 3/11 and Sandy Hook Hoax: both events are confusing in terms of which part of the agenda are the perps REALLY trying to advance? the part that seems obvious (Green agenda for 3/11, Gun Control for Sandy Hoax) or less obvious part(s)?